Optimistic Googlers will enjoy today's salute to the Leap Day or Leap Year, whichever wording you fancy. It's one-minute of ragtime music from Kevin McCleod titled "Merry Go Slower." Along with the classic Google home page, the YouTube version recognizes the 220th birthday of Italian composer Gioachino Rossini, born February 29, 1792. As a refresher, Leap Year happens once every four years in order to correct the mathematical difference between earth's travel and the Gregorian calendar. The correction started in 1592. This Google Doodle was created by Google Doodle Team Leader Ryan Germick who also penned the popular interactive Pac-Man and Les Paul doodles. It's this kind of whimsy that keeps Google fresh, innovative, and yes, optimistic. I watched the Academy Awards tonight. It was the 84th consecutive year that the movie industry has gathered to honor its brightest stars - the actors, directors, writers, editors and others that come together to make the magical moments that we enjoy in the theater. One actor said, "Movies are like watching our dreams in the afternoon." How true. Tonight was a very international show with best actor and film honors going to the French-produced film, "The Artist." The international awards combined with the pageantry of the show led me to choose today's song for Music Sunday at Experience Optimism. It is an international experience, "Lux Aurmque" performed by Eric Whiteacre and a virtual choir made up of vocalists from around the world, appearing via web cams and computers wherever they live. According to an interview conducted on MSNBC, Whiteacre is directing a virtual choir again this year made up of 3,800 individual singers from 73 countries. "Everyone is accepted," claims Whiteacre, "and their only motivation is to be a part of something good and beautiful as possible." I believe they are sharing optimism with their voices and virtual connection to each another. Thank you for the beautiful experience. 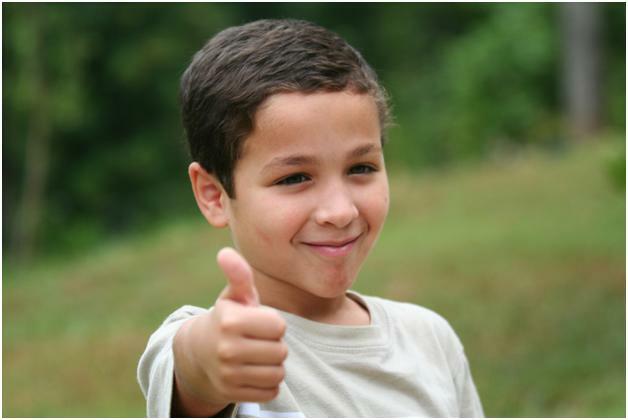 I've said it here many times: Optimist Clubs help children reach their full potential. What I also hope that I have instilled is that Optimist Clubs help adults reach their full potential too. By offering opportunities to serve your community, learn and grow with your friends and colleagues, and take on leadership roles that enhance your budgeting and management skills, Optimist Clubs can help you build your confidence to get a promotion or the raise that you know you deserve. must have also sponsored a new Optimist Club. Pretty simple requirements, don't you think? So I always marvel when clubs that don't meet what is expected of them shrug it off by saying, "Well, we don't do it for awards anyway." I doubt that is true. I highly suspect that clubs that say they don't do it for awards have gotten complacent, and maybe a tad lazy or so independent that they don't want to report to anyone else: but I'm here to tell you such mediocrity must stop. I was visiting Saint Alphonsus Regional Medical Center in Boise today and I noticed that its awards were proudly displayed and prominently advertised. The award shown to the right is an example of a recent award from "HealthGrades," the nation's most trusted source of information about health care providers. This award says that St. Alphonsus is a Distinguished Hospital for Clinical Excellence for the second consecutive year. What if St. Alphonsus employees and their supervisors woke up one day and decided that they didn't need any more awards? Would customer service and patient care decline? Would patients suffer? Would staff who want to work somewhere that makes them proud leave? I hope I never have to find out the answer to those questions. I appreciate that hospitals and companies and some individuals strive for excellence. We inherently know that sometimes we will come up short of our desired goal, but one has to try to succeed. To not try is giving up, a step towards the end. Whether you represent a hospital, a service club, or just yourself every day, you must give life the attention it deserves. Always work only for the best and expect only the best. Believe that you can and you will achieve. Optimist Club leaders, you must lose the crutch of apathy. The award may not mean that much to you, but what it stands for should. It shows that you care. I haven't seen the remake of the movie Footloose, but I like Blake Shelton's version of the song. In fact, so much so that I decided to highlight it right here for Music Sunday at Experience Optimism. It's a fun romp back to the 1980s even if the drive-in movie in the video feels like it goes even further back in time. However, I couldn't highlight this song without thinking of Kevin Bacon and in six degrees of separation fashion, that leads to another thought, which leads to another thought and so on. You get the picture: one cannot mention Kevin Bacon's name without thinking about connections. The greatest benefit of social media, including blogs and microblogs, is the ability to connect with others. Whether they be people you know or have yet to meet, and even some you will never meet in real life, the ability to share ideas, stories, current events and even opinions is inspiring and addictive. Kevin Bacon knows that and using the six degrees game as a launching pad, together with Network for Good, he started his own organization to help others raise money sharing their own six degrees stories. "Everyday celebrities championing good causes" are the stars of SixDegrees.org. Find out how you can use the SixDegrees.org website to move your mission, cause or organization forward or log on and make a contribution to more than one million charities that are already registered at the site. It's like being connected to Kevin Bacon --> Network for Good --> Your Charity --> You. It's JOOI of Reading Month in Nebraska. This is the month that students involved in Junior Optimist and Octagon International Clubs encourage others to read as they share the magic of literature. 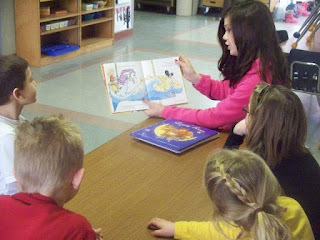 According to the Nebraska District JOOI director, Mark Claussen, JOOI members participated in JOOI of Reading month in a number of ways including proclamation ceremonies with Governor Dave Heineman and Mayor Sue Fuchtman and reading to students in grades K-2 in five different elementary schools and at Head Start. They also collected and gave away 300 books to students. Like any Optimist Club, JOOI Clubs are autonomous and can choose the projects that they think will benefit their communities most. I am always impressed when children engage with their younger cohorts. To offer friendship, serve as mentors or just a positive role model builds character for all. Their adult sponsors are equally rewarded when they see the good deeds of time and attention being paid forward. It gives every Optimist Club member hope that optimism – and Optimist Clubs – will live on in the years to come. I'm especially touched by this program because of my love for writing, but most of all, it is through the eyes of these children that we keep our ideas fresh and forward-thinking. Optimist Clubs, like all service clubs, stay vital and vibrant when we embrace the wisdom of all generations. Last Sunday, I began to notice the #optimists hashtag on Twitter. Optimistically, I clicked hoping to find Optimist Clubs front and center and getting the attention they so well deserve. But what I found was the UCLA website honoring the class they are calling The Optimists. The Optimists is a collection of remarkable celebrity stories that began with an education at UCLA. Included are filmmaker Francis Ford Coppola, athlete Jackie Joyner-Kersee, baseball player Jackie Robinson, actor James Dean and Vinton Cerf, who is recognized as one of the founding fathers of the internet, among others. According to the campaign, optimists see how to overcome barriers and that's what sets them apart from others. They are dreamers that do more than dream, and achievers who don't want to famous, but do want to be great. Does the spirit of the service clubs formed under the Optimist International brand share similar qualities with The Class of Optimists from UCLA? I think so for in every project performed by an Optimist Club, there is a sense of greatness that passes from adults to children and continues to radiate outward into the community, making our neighborhoods safe and nurturing. When adults care enough to share their positive dreams, they embolden themselves and empower others to reach for more. Yes, the spirit of optimism is all around us. Not every student will have the opportunity to attend UCLA, but every person has the opportunity to join an Optimist Club. Go ahead. Be an Optimist. Visit an Optimist Club near you today and join with others to make your community a better place to live. With your commitment, you can help students, like the individuals who are the UCLA Optimists once were, prepare to fulfill their dreams. I chose to join an Optimist Club because in my hometown the Optimist Club represented influence and affluence. To belong to this group meant something more than joining a service club; it was an opportunity to be mentored by some of the most successful business people in the community and to occasionally rub elbows with them in social settings. It was prestigious. Funny, as a teenager, one never wants to be associated with the group tagged as social climbers, yet then and now, we all seek that prestige of belonging when we buy expensive accessories like handbags or tennis shoes that align us with certain groups. We even carry around a Starbucks coffee cup like a badge of achievement sending the messages, "I can afford it," and "I'm worth it," among others. Prestige may be a subconscious trigger, but compelling nonetheless. Yesterday, I attended a regional gathering of Optimist Clubs in Twin Falls, Idaho. This club is fast approaching the 150-member mark. An active and vital service organization, they have that prestige trigger working for them. The prestige of belonging to the Twin Falls Optimist Club is that you get to associate with fun people who are actively involved in positive change the community. Isn't that motivation enough? Perhaps, but even more encouraging is to learn that all of those many people really care about their community and what's more, they care about you. On my way home from the meeting, I heard the sad news that vocalist Whitney Houston had died. Sparked by the feeling of belonging to an Optimist Club, I thought how sad this remarkable artist was not able to find such comfort in her life. Despite her success, she seemed to live on the fringe. In tribute to Whitney Houston and others who grapple with their own dependencies including issues of self esteem and others, I offer this powerful song, "Someone Like You," by Adele for Music Sunday at Experience Optimism. "I wish nothing but the best for you," sings Adele. That single line reminds me of the feeling I get from the Twin Falls Optimist Club members. Concern, combined with a sense of belonging can be a powerful force for good. One of the most ambitious website projects to be conducted by an Optimist District is going on in the Pacific Northwest. This district has created a dynamic blog platform that incorporates all 50 Optimist Clubs in the district. The PNW District stretches from Idaho to Alaska and includes Oregon, Washington and British Columbia. The main blog site attempts to highlight stories from all around the district and bulletin editors and others are encouraged to contribute to their own blogs which also serve as an enhanced club directory. Visitors can go on a quick tour by watching this video. Click here to visit the PNW District blog. Do you belong to an Optimist Club in the PNW District? They are looking for authors, photographers and more. Contact the district at this link for an assignment. Optimist International posted a poll on Facebook today asking their friends to tell them which line of the Optimist Creed they try to follow. Well every true Optimist Club member tries to follow each one. We're kind of geared that way. 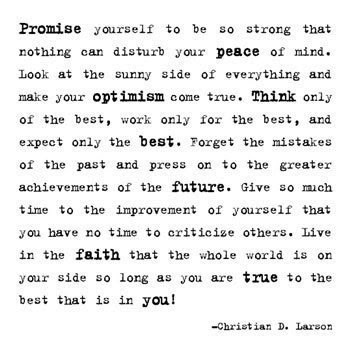 Written by Christian Larson, the Optimist Creed was adopted by Optimist International in 1922 and is the single most unifying force for Optimist Clubs around the world. While the leaders often speak of finding a flagship program in order to engage others, I wonder why. Spreading optimism around the world seems like a flagship program to me. In fact, others like journalist Gretchen Rubin and Tony Hsieh, CEO, Zappos.com are doing something similar by sharing happiness. In England, a national movement was launched just last year to promote Action for Happiness. They say, "Doing good feels good." I agree. Are optimism and happiness the same thing? Not exactly, but optimism - the act of thinking positive thoughts - will lead to happiness. Thinking of good things will make you happier; and when you are happy, it's easy to look at the sunny side of everything. That's optimism; what a great way to live! Go ahead, take just a moment and read the Optimist Creed aloud and tell me if you don't agree. This is a post that will get an update as soon as the version that inspired me is posted to YouTube. I'm watching The Voice and Jesse Campbell, a young, inspiring artist has performed a remarkable rendition of the Leon Russell classic, "A Song for You." In my haste to post on Sunday evening, I compared Mr. Campbell's song to a different artist and song. My bad. Funny, I kept listening to the other song, which will now remain nameless, wondering, why doesn't it sound right? And as I was singing the correct song in the shower this morning, I realized my mistake. I'd like to think I sounded sort of like Willie Nelson. I definitely didn't sound like Christina Aguilera who, by the way, I did not even realize had recorded the song. Great song. Great artists; but Mr. Campbell, you have my vote on The Voice. Good luck to you. And friends, really now, it's your job to keep me straight here when I go astray. Sun Valley, Idaho takes an optimistic approach to their economy every year by assisting Mother Nature with their own snow-making machines. While other ski resorts were struggling to open, Sun Valley logged-in a record December because every night, they have the ability to produce 2-3 inches of snow. Thanks to KTVB.com for the video story; please watch to find out more about snow-making and how it keeps the economic engine turning for the famous ski resort. Make your plans today to ski Sun Valley. One of my favorite movies of all time, Ferris Bueller's Day Off, gets a revival for this year's Super Bowl in a commercial for Honda. Only this time, Mathew Broderick is playing himself as he tours around town, taking a day off from acting, in his Honda CRV. The commercial is enjoyable enough for a trip down memory lane but at 2:25, it's long enough for me to ask, "Really?" What are those commercials worth this year? The reports say $3.5 million for a 30-second spot. Well, you can be the judge. Did Honda use their money wisely? The original movie gave us a lovable character that we all wanted to be, or at least be friends with, his adoring cohorts and fans, and a friendly romp through Chicago. This friendly romp through Los Angeles felt a little desperate to me, but then, isn't that part of the aging process? After Sunday, the question on the minds of Americans will be, do I still want to be Ferris? Or maybe, with more than 6 million views on YouTube as of this post, maybe they are already asking that question. And the answer, is...Oh, yeah!